It’s no secret that social media has taken over the lives of millions—and our many association members are no exception! That’s why AMC clients use this low-cost, high-impact advertising and engagement tool to its fullest with innovative initiatives that truly are worth Tweeting about. 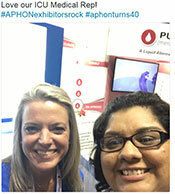 The Association of Pediatric Hematology/Oncology Nurses (APHON) hashtag challenge, launched at the association’s 40th Annual Conference and Exhibit in September 2016, is a perfect example of how a simple phrase can create a conversation with effects that last long after the event is over. 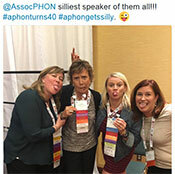 Using a mix of silly and serious hashtags—including #APHONRibbonWars, #APHONGetsSilly, #APHONExhibitorsRock, #AHPONEducates, #APHONTurns40, and #APHONCelebrates—APHON encouraged members to document their experience at conference via Twitter, Facebook, and Instagram. And members responded with enthusiasm! The association reported a 12% increase in Facebook “Likes” and a more than 28% increase in Twitter traffic during the 3-day conference. Like the challenge itself, marketing the initiative was simple and straightforward. APHON advertised the hashtag challenge to attendees via email in advance of the conference, and reiterated the messaging onsite with a flyer in each attendee tote bag and signage at the convention center. To further incentivize attendees to participate, APHON offered a host of small prizes to the social media mavens who best represented the hashtags on their personal profiles. However, despite the giveaways, Sayen was quick to note how cost-effective the program was compared with the outstanding results—and to emphasize APHON’s intention to create all-new hashtags to celebrate and promote their 2017 Annual Conference and Exhibit in Palm Springs, CA.